News of lowered consumer confidence continues to shadow an economy made prosperous by the mining sector. Even Channel 7 reported tough times at the Queen Victoria Market (QVM) on their 6 'o' clock news on 30 June. Instead of succumbing to winter and economic blues, QVM has decided to launch a market festival for 4 Wednesdays in August. The Market is already famous for its year-long program of market festivals. Dotting the calendar included the Indonesia Street Festival, Next Wave Festival Fresh Produce, Winter Seasonal Stars, A Taste of Portugal and Malaysia Street Festival on Sunday, 14 October where you can sample food from Malaysia and Singapore. QVM's Suzuki Night Market of 15 years has become Melbourne's summer accompaniment for throngs of after-work locals and tourists with its live music, food and merchandise stalls.What could be better than to liven Melbourne's winter with theatrics. To learn more about QVM's well-kept secret winter festival production, Luna 1878, I spoke to Ms Simone Cilia, responsible for putting strategies and plans together to promote all the events at QVM as the Events Marketing Coordinator. All the events Simone promotes are free to the general public and Luna 1878 is no exception. In fact, this event and conference professional of 6 years takes pride in putting on quality events that are accessible to everyone. Presented by Flemington Community Bank, Luna 1878 is a celebration of Melbourne's winter, the night and bringing it all back to QVM, which started in 1878. The team at QVM recognises that Melbourne is fast becoming a 24-hour city. Simone believes that fellow Melburnians are looking for something of interest to do in winter that doesn't always involve staying indoors. Ms Misti Dullard, QVM's Marketing Manager of 7 years feels that Melbourne's vibrancy and market lifestyle entices people to explore the city. Therefore Luna 1878 would be an attractive winter night sojourn for many Melburnians and visitors. Winter is often cold and dreary but Luna 1878 presented by Flemington Community Bank promises to provide a cosy place of lively performances and whimsical fun and a midwinter's night dream filled with the warmth of open fires, storytelling, themed entertainment, romantic dates, mulled wine and hearty food in the city. Although there are similar elements to the successful summer Suzuki Night Market, the QVM team behind the winter version is aiming for a completely different feel by focusing on Melbourne and all the interesting and beautiful things that define her as a city. What Luna 1878 will try and do is bring many of those elements to the one place and allow patrons to experience it all. Working with around 70 stalls of artisans and food sourced from Melbourne, highlights include a theatre of food from Eastern Europe, Nepal, South America, Sicily, wine tastings and an array of hot drinks to complement the rolling line up of roving maestros and cabaret stars that will change each week. Artisans will be displaying hand-made glass tile jewellery, vintage inspired hear wear, hand screen printed leggings, fine art and haute couture accessories, handbags from recycled materials, iconic photographs of Melbourne, psychedelic organic artwork, canvas art prints and illustrations. 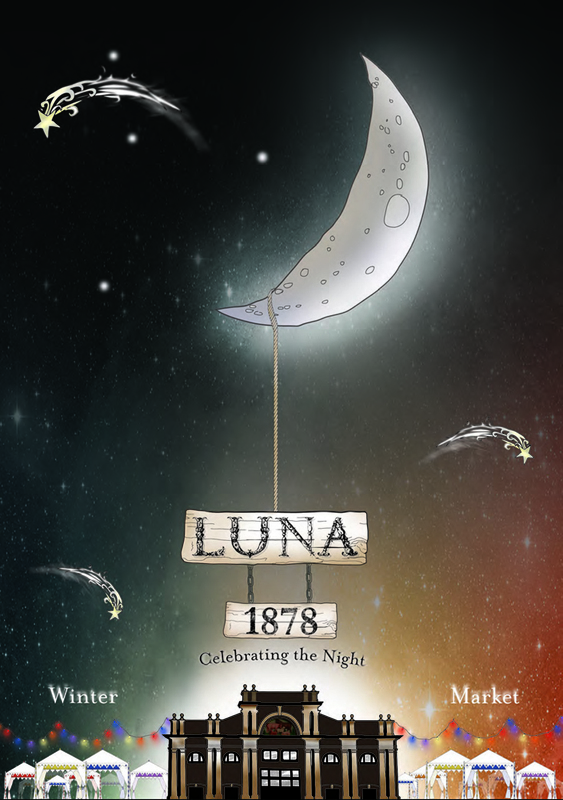 Everyone from the event staff to the traders are pitching in to produce Luna 1878, including input from some of the most creative and interesting traders and contractors.Troughs of backbreaking effort currently go into unveiling this winter version by 8 August. Simone's small but dedicated events team is working tirelessly to include more theming and detail into Luna 1878 and ensure that everything is set up and the Market is beautiful and warm by 5 o'clock for when patrons arrive every Wednesday night. This new night market event will be a sensory cornucopia featuring some of Melbourne's best independent performers, designers, artists, chefs, winemakers and foodies. Simone and her team are even ready for old man winter's wet fingers. If you are willing to brave the cold, Luna 1878 promises a cocoon of cosy warmth with family, friends and like-minded people socialising over steamy drinks and food within the historic sheds of QVM. Perhaps like its summer sister, this night market may become a winter institution for young and old alike. Winter in Lionel's Melbourne looks set to become a cuddly humdrum of patrons and vendors bopping to a night of theatrics, live music, shopping and steamy meals in the city. With the sunny beams of the sweet moon as my faithful companion, I may just be that merry wanderer of the midwinter's night. Bretzel.biz will be there, serving on 8.8.12 : "Linsensuppe mit Wiener" a hearty Lentil Stew with Wiener Sausages and a of course a Bretzel, a very traditional German Meal. We are very excited to be part of Luna 1878!